This is one of the amusing releases from CARLTON WARE in their 'Walking Ware' series produced in the 1980s. This one is the 'Big Foot' in the form of an Egg Cup. 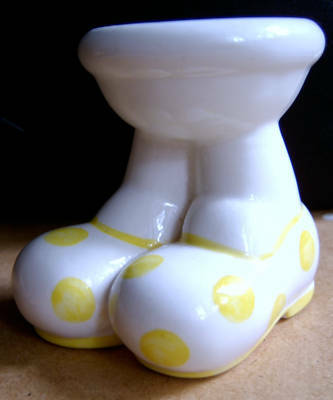 Designed by Roger Michell (Lustre Pottery) for Carlton Ware, this particular piece has the very collectable large yellow-spotted shoes. The overall height of the Egg Cup is 3 inches (8 cms) with a similar diagonal measurement across the base. The Cup is in excellent condition. It has a minute mark under the glaze on the rim of the cup which I imagine was not noticed before glazing. If you wish to discuss delivery, invoicing or would like to make an offer, please use the ‘Contact Us’ tab at the top of the page. Please don’t forget to identify in the email the product concerned.